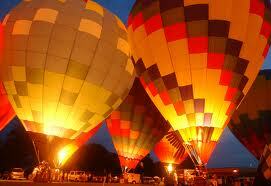 Kentucky Derby Festival Great Balloon Glow April 26th | Joe Hayden Real Estate Team - Your Real Estate Experts! The Kentucky Expo Center invites everyone out on Friday, April 26th to enjoy another fine Kentucky Derby tradition, the U.S. Bank Derby Festival Great Balloon Glow. The skyline will light up at 9:00 p.m. as the pilots simultaneously fire up their burners. As with many Derby events, families can enjoy the warm glow of the colorful balloons for the mere cost of a 2013 Pegasus Pin. The Derby Festival Great Balloon Glow is one of the most popular events prior to Derby and has drawn well over 50,000 fans in previous years. The 2013 event promises to have even more balloons to light up the night and encourages spectators to walk around and chat with the pilots. The friendly travelers of the air will answer questions, tell tales and entertain childhood dreams of flying the skies in a balloon carried basket. Once the sun fades out, the grounds will illuminate with a warm glow set to an entertaining synchronized musical composition. The Great Balloon Glow is a fun-for-the-whole-family event with the gates opening at 6:00 p.m. for those wishing to chat with the participating airmen and women. The event is free with a Pegasus Pin, but the KEC parking is $8. Those who want to see the event without actually attending will find the Balloon Glow broadcast live on MeTv Louisville 32.2 or Insight Cable Channel 188.